This is not your regular cat. Unlike most kids these days, Bubba is more than happy to go to school and attending classes. 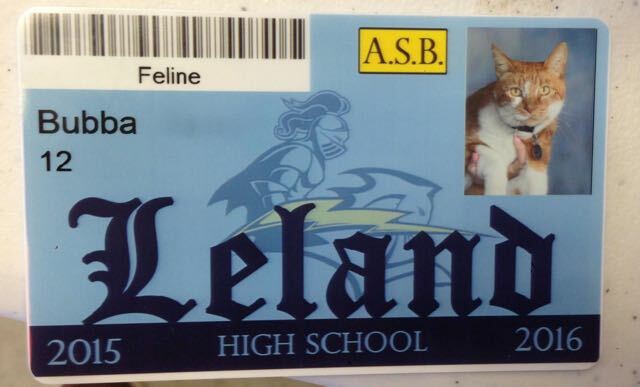 Matter of fact, he even have a student body card at Leland High School in San Jose, California. 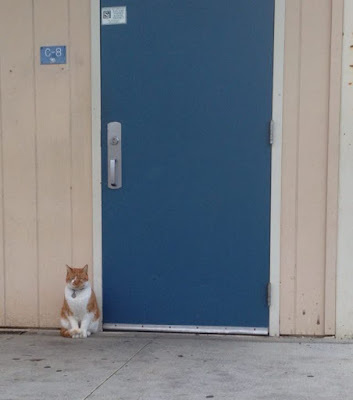 He is also the official campus cat there. Like a cool kid, Bubba will usually attend classes, go to the school sporting events and sometime he even hangout with the students. At first, Bubba is an indoor cat. But he wasn’t happy staying in. So he started to let his family know frequently and loudly that he wanted to be with the students. Amber Marienthal, the person who adopted Bubba back in 2009 said a lot about this lovely and social cat. One of them including how this one teacher once make a mistake by buying a treats for Bubba. Now Bubba will wait by his classroom door and meowing demanding for treats. That’s the story of Bubba, a cat that love school. 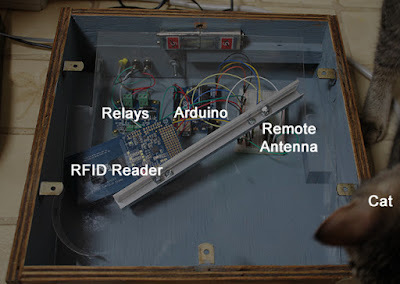 A man named Ben Millam had created a machine to feed his cat. However, this machine is not going to give food to his cat just like that. To eat, his cat will first need to “hunt” for a white plastic ball; the cat then will have to put the ball inside of the machine to get some treat. The white plastic ball will be located around the house. Whenever Monkey (The cat is called Monkey) found the ball, he can put it into the machine and food will come out of the feeder. So instead of feeding my cat, I hide these balls around the house… This all started after I read an explanation of why cats go about repeatedly exploring the same areas: it’s partly to establish and survey their territory, but they’re also practicing ‘mobile’ hunting: moving about, being curious, and poking their noses around in the hopes of upsetting potential prey and finding a meal. So what if my cat, while out on patrol, actually found its prey? Surely this would bring him one step closer towards a more fulfilled and self-actualized indoor kitty existence. This is actually a pretty good idea since cats are hunter in their natural habitat and seeking and founding “food” might be exiting to them. However, it might be even better is the white ball can move and the cat actually need to chase and hunt it. It’s dangerous to go alone, take this with you. People don’t usually bring their cat along with them when they want to go out. And most of the time, the cat didn’t want to come along either. But it is different for these felines. 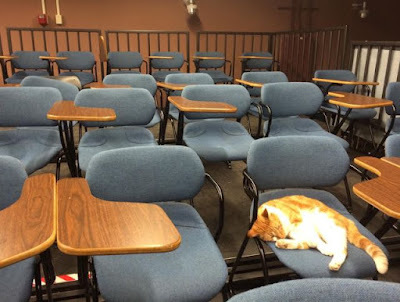 These are the kind of cats that seem ready to be taken anywhere! They even put themselves readily in a bag too, so it will be convenience for you to take them with you. What about your cat? Are your cats ready to go on an adventure with you too? It is pretty common for cat owners to come home and discover that their cat is sleeping or chilling in place that doesn’t really look comfortable to us, such as a cardboard box. Scientific studies suggest that there are two main reasons why cats are acting like this. 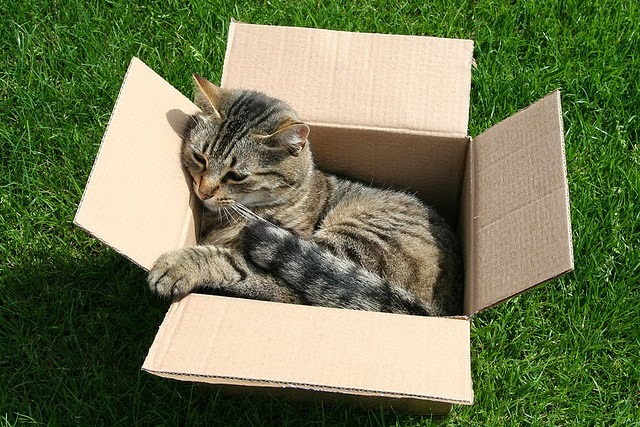 Study conducted at Utrecht University in the Netherlands suggest that boxes make cats feel less stressed because when they’re hiding in it, they’re less likely to get interrupted. In their nature habitat (the wild), cats use places similar to boxes as a hiding place where they can relax while avoiding prey. However, indoor cats might use the boxes to hide from their owners to avoid unwanted stroke or interruption from their owners. Another favorite places for cat to hide including under the table and chairs. The National Research Council had conducted a set of research in 2006 and they found that cat love to sit inside box because it can keep them warm. So the next time you see your cat sitting in a cardboard box, it might be a great idea to let him be and turn on your heater. Remember our previous post about 3 tons of cats was rescued from being eaten? Since the local police don’t know what to do with the rescued cats, they finally decide to bury all of those cats. 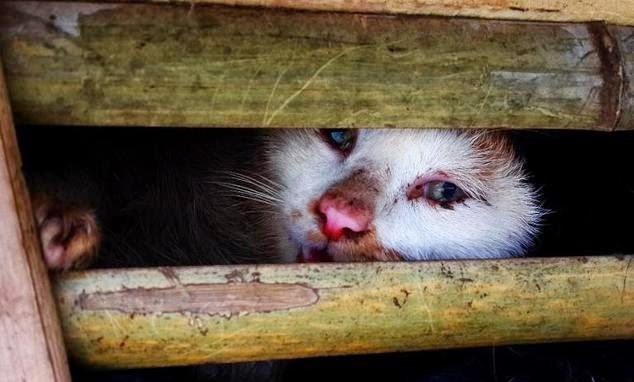 To save those innocents cat life, an online petition was started and an appeal was even sent to the Vietnamese embassy in the U.S. However, the efforts didn’t seem to bring any positive result. A Wisconsin-based animal rights group, Global Conservation Group had set up an online petition on Change.org and had successfully gain over 22,000 signatures. However, the petition doesn’t seem to help in their effort to save those cats. Nevertheless, they will keep working with Asian based animals right group to prevent this from happening again in the future. Due to their cat awesome attitude, many cat owners think that it is OK to left their cat home alone for a long period of time. They think their cat will just continue with his or her business like he always did. Eating, playing and pooping. This is simply not true. Below are 10 reasons you shouldn’t leave your cat alone for a long period of time and what you should do if you need to be away. There are a lot of cases where owners come home and find that their cat is either dead or dying due to illness. Some common feline disorder such as urinary blockages can cause death to your cat but your cat can probably be rescued if someone is around. A fresh or canned food is better than dry food. But you can’t feed your cat with fresh food if you’re away and there is no one around to feed your cat because fresh food will get spoiled if exposed to the air. 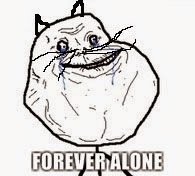 Leaving your cat alone mean there is no one to clean their litter box. This can cause many kind of problem such as illness and your cat might end up pooping on the carpet due to his litter box being too dirty for him. Cat need to interact with his owner. It is pretty common for cat to develop behavior problem due to being left alone at home. They need to interact with other human or animals. Who know, you cat might stuck somewhere in your house during playtime and need human to save him. If no one was around, your cat might get in very deep trouble. So, what should you do if you need to be away? The easiest thing that you can do is to hire someone to take care of your cat OR simply arrange someone (Friends, family members) to visit your cat once or twice a day to feed him, clean his litter box and see if he’s OK.
Reuniting with your pets after disaster can be a lot more easier after this as students at the University of Colorado Boulder had develop a website that can help people reunite with their pets. The website, EmergencyPetMatcher was developed by Mario Barrenechea, 25, and Joanne White, 45 to help reuniting owners and pets after a disaster such as hurricane, earth quake and wildfire. After Hurricane Sandy, The developers realize that social media can be use as a platform to help people to find their items and pets after a disaster. 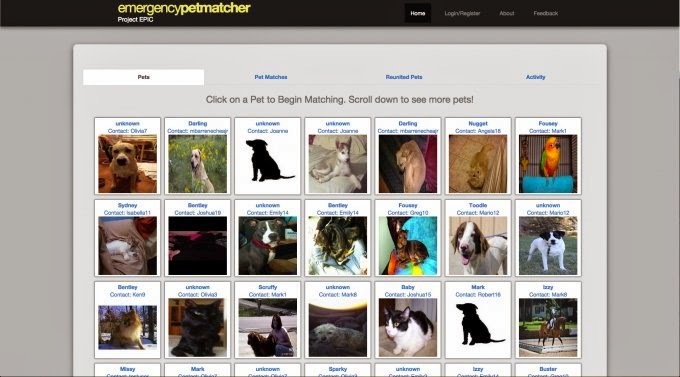 Users at EmergencyPetMatcher need to create a profile for the pet that they found or for the one that’s missing. Other user will suggest that both photos is a match if he or she think that both photo from missing pets profile and founded pets profile are the same pets. Other users will be able to up vote the matching photos if they agree, or down vote it if they think those are not the pictures of the same pets. When the amount of up vote is enough, email will be send to the creator of both profiles, suggesting that they should contact each other. “A lot of people are looking for ways to help. It doesn’t matter where they are located in the world. With this system, it allows them to be able to help." The website is not currently online as the developers are planning to release the website during a disaster.